We were pleasantly surprised to be featured over at the Apple Brides blog this past week. Two features in as many weeks, exciting stuff going on. Apple Brides is a fantastic bridal resource. Take a few minutes and go check out all they have to offer in assisting you with your dream day here. Oh and in case you've missed it, the Idaho openers have dropped and are available in our shop. Cheers! If you're not already following The Beeroness, I can assure you that you are missing out. Jackie creates some downright amazing recipes with one of my all time favorite ingredients, beer. 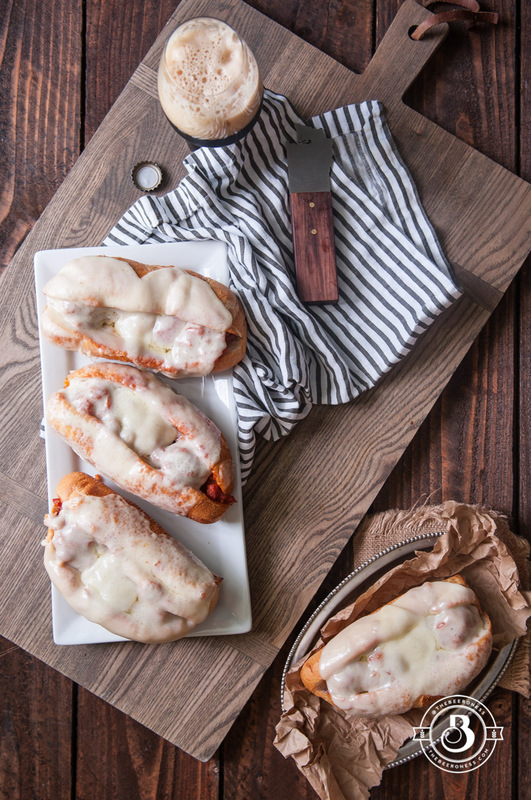 I was really excited to be notified last week that one of our openers made a cameo appearance in her blog with a fantastic Porter Provolone Meatball Subs recipe. And though I might be a tad partial, I think our opener looks incredibly handsome along side the subs. I'm really digging the cutting board too. Check out this recipe and many more, as well as some more wonderful photography here. Cheers! Holiday Gift Kit has dropped! Finally, after many delays in both the virtual world and real world, the Holiday Gift Pack is here. The largest wind event in Spokane's recent history took power out for more than a week now for many in our region. At one point after last Tuesdays storm, over 67% of Spokane was without power. We were out for 6 days at our place and spent a good deal of energy cutting up our tree that landed on our neighbors house. Fortunately very little damage was done and everyone is safe. After all the weather hoopla and technical issues, the 16oz. "WAsome" can glass has finally dropped and is now available. Swing through the web-shop and take a look at all the handle options. Get your order in for that favorite beer lover of yours stocking stuffer. New batch of stainless tangs has arrived. Pretty excited to have a new batch of material on hand. Lots of really cool stuff in the works. Stay tuned. Washington is a beautiful state, rich with natural beauty and an unlimited supply of adventure. Our state also has an incredible craft brew scene. I wanted to provide a functional piece that took these things into account and merged them into a timeless and stylish hand tool celebrating the upper left, the WAsomePNW.